Physicists love to smash things together  not just because there's a certain guilty pleasure involved, but also because you can learn a lot about nature that way. Men and women who study elementary particles conduct their demolition derbies with atom smashers; that's how they discovered quarks and muons and maybe even the long elusive Higgs boson. For astrophysicists, things are a little tougher. Collisions between planets, stars and other heavenly objects can be just as enlightening as particle crack-ups, but you can't simply make them happen. Sometimes the stargazers get lucky, however, like when a comet broke apart and peppered Jupiter with interplanetary shrapnel back in 1994, yielding valuable information about the atmosphere of the solar system's biggest planet. And sometimes these random cosmic collisions take place on a truly gigantic scale. 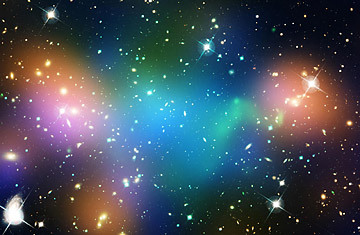 That's the case with Abell 520, a cluster of thousands of individual galaxies about 2.4 billion light-years from Earth. The structure of Abell 520 is so jumbled and chaotic it's informally known as the Train Wreck Cluster  and in fact, it was created by a humongous, slow-motion pileup of three or four galaxy clusters that were already huge in their own right. Rather than solve a mystery, though, new observations of Abell 520 may actually have pushed astronomers further from answering one of cosmology's longest-standing mysteries: What is the true nature of dark matter? Observers know that dark matter is out there because they can see its gravity pulling on the visible stars and galaxies. They know it's truly massive, weighing in at five or six times the mass of all those stars and galaxies combined. But since they can't actually see the stuff directly, scientists have concluded it's probably made of enormous clouds of some still undiscovered subatomic particle (and if they're right, dark-matter particles are passing harmlessly through your body by the billions every minute). This idea got a big boost back in 2006 when astronomers used a suite of telescopes to observe an object known as the Bullet Cluster, a pair of galactic clusters that had recently passed right through each other (recently meaning in the past billion years). Clouds of normal gas within the two formations slammed into each other, slowed down and heated up. The galaxies themselves, whose billions of solid bodies are spaced too far apart to hit each other directly, just kept going. If dark matter truly has the properties physicists believe it does, the clouds of the invisible material pervading each cluster should have just kept going too. That's exactly what happened: even though astronomers can't observe dark matter directly, they can see that more distant, background galaxies look distorted, thanks to the dark-matter clouds' intense gravity. So far, so good. But now comes Abell 520, the cosmic train wreck. In theory, you'd expect the dark matter there to do what the dark matter did in the Bullet Cluster: stick with the galaxies it came to the party with. But when observers trained the Hawaii-Canada-France telescope atop Hawaii's Mauna Kea on A520 a few years ago  you know what's coming, right?  it didn't seem to work out that way. Again using the distortions of background galaxies to map the foreground dark matter, they discovered that, unlike in the Bullet Cluster, the dark matter from the original clusters has formed into a distinct blob of its own, with few if any galaxies embedded in it. That observation could have been a mistake. But now the astronomers have taken a much closer look, with the much more powerful Hubble Space Telescope, and the dark-matter blob is still there. "We were not expecting this result," said astrophysicist Arif Babul of the University of Victoria, who worked on both the original and the Hubble observations, in a press release. As for what it all means, nobody really knows. One possibility is that dark matter is made of a different sort of particle from what everyone's been assuming. Another is that there are galaxies embedded in the massive blob after all, but that they're dimmer than normal galaxies (which itself begs the question of why). Finally, it could be that the collision of multiple galaxy clusters involves some complicated dynamic process that throws everything off in some unexpected way. Sadly, unlike a particle physics experiment, this collision can't just be run again to see if things happen the same way. So the astronomers are now trying to model the Train Wreck Cluster inside a supercomputer to see if they can figure out what might have happened  and whether theorists have been kidding themselves all these years in thinking they were finally getting close to solving the dark-matter mystery. MORE: Do Invisible Galaxies Swirl Around the Milky Way?